During his long life, Pablo Picasso was constantly working on giving form to his observations of reality and his vision thereof. To achieve this, he was always seeking new, uncharted routes. In 1948 he settled in Vallauris in the south of France, where several potteries are located. There he bought an old perfume factory and turned it into his studio; here he experimented with clay and glazes. During the same period, he made sculptures composed of found objects with great ingenuity: a broken pot, a wicker basket, a fork, a saddle, a bicycle handlebar. Referring to the genesis of these sculptures, he said: ‘I don’t seek, I find’. The expressive Little owl was also created in this way. 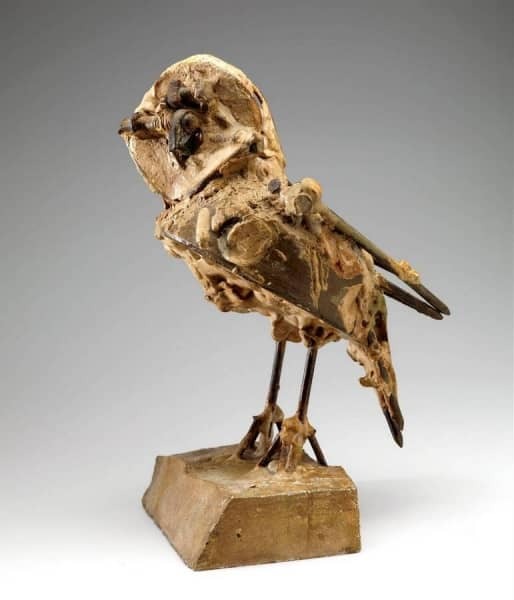 Picasso made a part of the owl’s body from an earthenware bowl. The lid of a tin can serves as its head. The wings are made of long, straight nails and the feet and claws of nails and screws. For the bird’s curved beak he uses parts of a pair of pliers and for the head, a few nuts and bolts. He models the rest in plaster. Thus, from garbage he creates this lively, alert, small bird of prey.